Jazz-performance in Vanemuine Theatre, Tartu, Estonia. Premiere at 22.09.2012, nineteen performances in season 2012/2013. 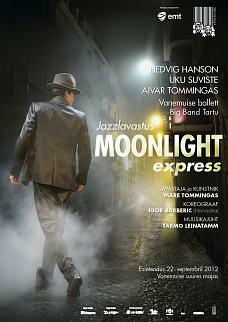 MOONLIGHT EXPRESS Jazz-performance in Vanemuine Theatre, Tartu, Estonia. Premiere at 22.09.2012, nineteen performances in season 2012/2013. Jazz music with its hundred-year long history has been an open kind of music right from the very beginning. Everything in its sound field can-may-will change into jazz. Be it classic, folk or pop on top of the charts. Frank Sinatra, Tony Bennet, Glenn Miller, George Gershwin, Benny Goodman, Diana Krall, Nat King Cole and others are the chosen ones, whose music will be interpreted by Hedvig Hanson, Uku Suviste, Aivar Tommingas and Vanemuine's ballet artists. 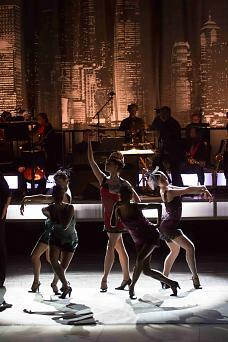 A grand spectacle with a new twist on jazz classics!